MistyTrails plays midwoof to many local breeders. I got another call from a breeder who needed help after her dam had her litter. 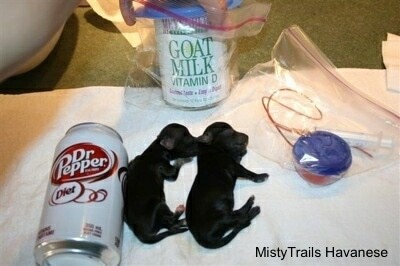 In the litter there were two tiny puppies born at 2.5 ounces (76 grams) and 3 ounces (88 grams). 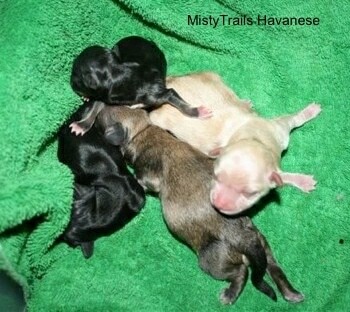 In her breed pups are generally 6 to 8 ounces, so these are very tiny puppies. 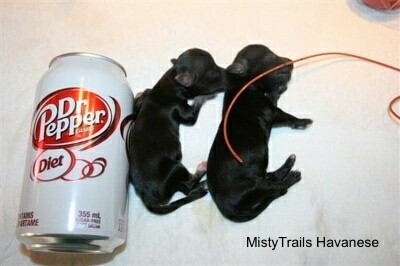 The other two pups born in her litter were normal size for the breed. They do not seem to be too preemie, as in premature for gestational age, they are just VERY small for gestational age. She came to me for a lesson on tube feeding, as without tube feeding these pups would not make it, and already on day two were fading. These pups need HEAT and FOOD. When the pups came to me they were not gaining weight. After tubing every two hours at 6:00, 8:00 and 10:00 p.m. at the rate of 1cc for every ounce of body weight (ie: 2.5 oz got 2.5 cc every 2 hours) the weights have come up. I am using concentrated goat milk, canned, for best results, but store-bought goat milk or puppy replacer milk from the vet are good too. 88 g. pup is up to 102 g.
76 g. pup is up to 84 g.
What the supplementing did was turn two fading pups around so that now they have the energy and strength to nurse. So far things are looking very positive for these two. Without human intervention they would have died, as they were already gasping. The first night they came to me they were constantly crying, the next day they were nursing and content.